Leftovers. 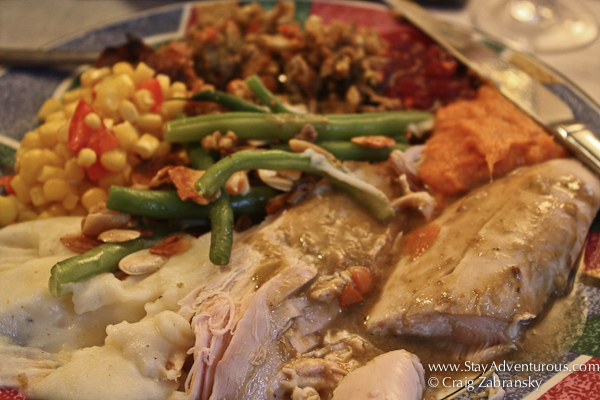 It is definitely a top five reason people cook Thanksgiving dinner. And for me that means Thanksgiving Tacos.Yes, all the goodness of a Thanksgiving meal wrapped up in a corn tortilla. yes I cooked all this. Surprised I cook Thanksgiving, don’t be it is my fifth time and heck I even use my own homemade vegetable broth to baste the bird too . Yes, call up Michelin and have them put me on their watch list, I have some talent in the kitchen. But it was just a few years ago when I first decided to try Thanksgiving tacos. I guess all my time Mexico influenced me in the kitchen too. And if there is one lesson I learned besides that everything goes well with salt and lime, it was that everything works in a taco too. And everything includes Thanksgiving leftovers. I sliced up the turkey (both white and dark meat) and sauteed it with butter, onions, garlic… the norm. Then I added some leftover mashed potatoes, stuffing, and yams to the mix. One hearty scoop of each will suffice to make two hefty sized tacos. Next I added fresh baby spinach to the sauté just at the end to warm. Some “green” was needed for color (and also to have at least one healthy ingredient). This year I used the spinach mainly because my string beans with crusted almonds and walnuts did not survive the Thursday gluttony. But it was a great substitute and one I will probably incorporate next year. 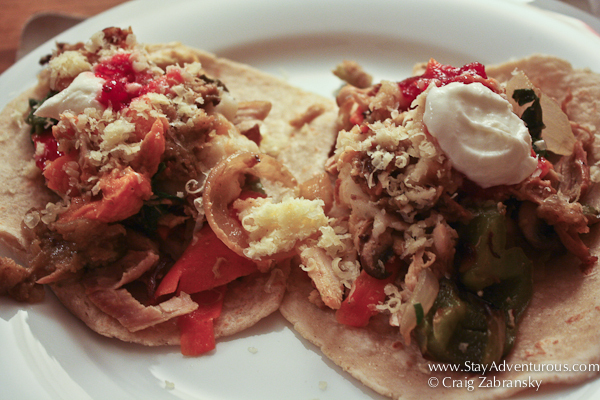 The outcome, Thanksgiving Tacos, was just as expected – delicious. What did you do with your leftovers? Thanksgiving & Tacos… Didn’t know those 2 would sound so well together. I knew Maggie was a lucky girl… just didn’t know HOW lucky! Looks delicious. I wish I had leftovers. Maybe next year. How many could you eat in a sitting? So simple, it’s simply the best idea… turkey taco! They were so good, and will become a Thanksgiving left over staple. I really think you can make everything into a delicious taco.